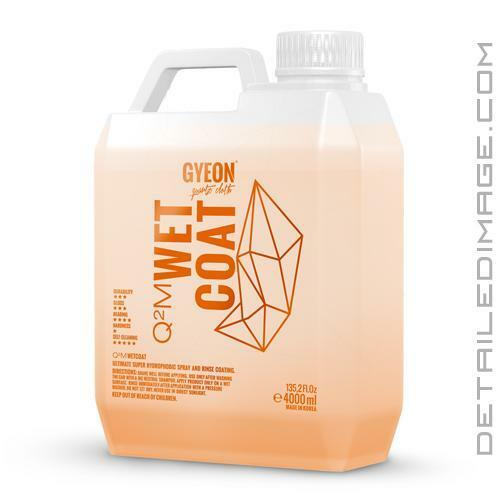 If you are looking to protect your paint without ever having to touch it, the Gyeon WetCoat is exactly what you are looking for! When performing any detailing step, there is always one thing in common, you actually have to touch the paint. When touching the paint, no matter how great your products and techniques are, you always have an increased risk of adding ugly imperfections into the paint. With Gyeon WetCoat, you never actually have to touch the paint, which allows you to greatly reduce your risk of adding imperfections into the paint! After you wash the paint, just spray WetCoat onto a still wet surface and rinse off after 2 minutes. Application is really that easy and it will leave you asking yourself why you did not use this product sooner! High end ingredients are packed into this unique formula, which allows WetCoat to leave behind an incredibly glossy, protected and hydrophobic layer of protection. This layer will last around 12 weeks and even help enhance any existing layer of protection already applied. Water will bead off the surface with ease and contamination, road grime, dirt, etc. will have a harder time sticking to the surface. This means that future cleanings will be much easier and take less time to complete. Use WetCoat on various surfaces like your paint, glass, rims, convertible tops, wheel wells and trim. Skip actually touching the paint and protect with Gyeon WetCoat! Overall Gyeon WetCoat has been a great product and I would highly recommend it to anyone looking for such a spray sealant. Ultimate Super Hydrophobic Spray and Rinse Coating. Use only after washing the car with a HQ neutral shampoo. Apply product only on a wet surface. Rinse immediately after application with a pressure washer. Never use in direct sunlight. Wet Coat worked just as claimed: sprayed on, rinsed off, beads water fine. It is nice to be able to add some protection from road salt during the winter. Someone recommend me to this item and I decided to finally try it and I love it. Makes the black on my car look rich even if it's dirty again. Can't wait to use it more and try it on my friends cars. 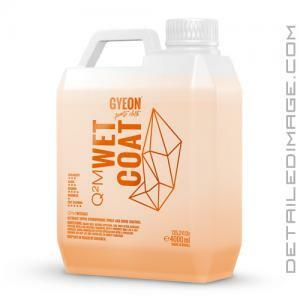 I was pleasantly surprised the first time I tried Gyeon Wet Coat. I used it on my Mustang before going to a car show. I have been doing ONR washes on her; it was the first time I pulled the hose and pressure out to wash her in a few years, I think it was in shock! After using my foam cannon and washing via the two bucket method, I rinsed the car down and applied the Gyeon Wet Coat as per directions. The hydrophobicity was apparent the minute I pressure washed it off. I followed up with free flowing water, then dried it with waffle weave drying towels. My car scored 194 out of a possible 200 points and I took home a trophy for her. I have it on all my vehicles now. It is now part of my "detailing arsenal".